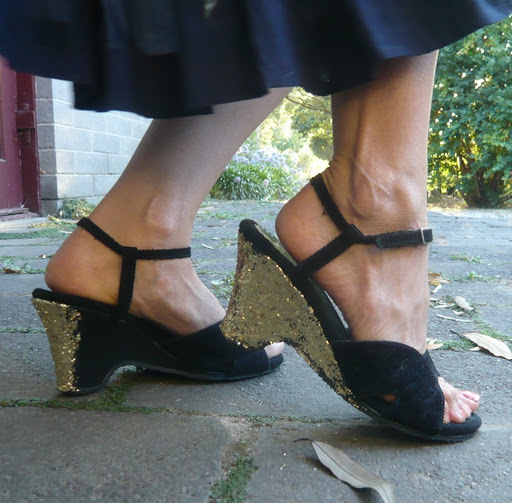 I got them years ago at Gap when I lived in Tokyo, but have since learned enough about my personal style to know that I just don’t do great big bows on anything, let alone wedge heels. So they were a prime target for some revamping. I unpicked the bows from them (and put them away, as they will no doubt come in handy for a future project), bought some glue and unearthed a bag of glitter from out of the garage. 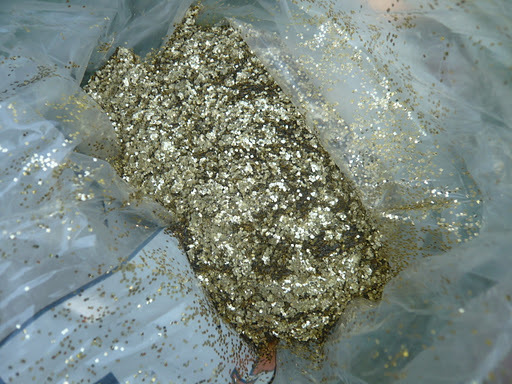 I know what you’re probably thinking – why did there just happen to have a huge bag of glitter in the garage? Well, my dad used to be an industrial chemist at a flooring company, and some of the flooring had glitter in it (maybe they were outfitting discos? It was the ’70s, after all). And let’s just say that this bag was, um, left over, so dad brought it home with him. I noticed it when I was cleaning out the garage years ago. I might have mentioned just a few times that I come from a family of hoarders. You never know when you’re going to need a jumbo sized bag of gold glitter, which would be why no one had thrown it out! Now this is where I stopped taking photos for you, mainly because there’s a proper tutorial on A Pair and a Spare, but also because my hands were too busy holding shoes and covering them with glue and dipping them into the bag of glitter and trying to patch up the gaps which you can see in this photo. Basically I spread craft glue over the outside-facing part of the wedges, extending it to just inside the instep as you can see here on my left foot. This was mainly because I got lazy, but I decided I could say it was part of the design! I quite like it, although I do need to tidy it up a bit as I didn’t spread the glue on very precisely. I was also going to add something like bright pink tassels or pom poms to the front of the shoes and change the straps but haven’t got around to that. 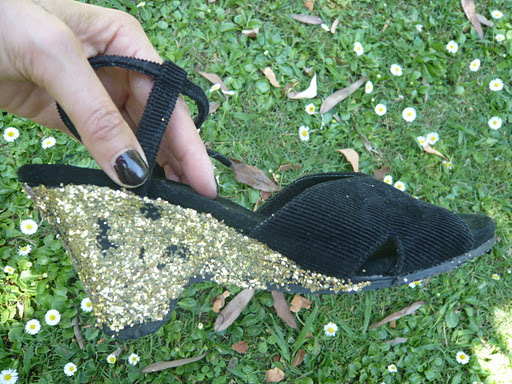 What do you think, do you like my new sparkly shoes just as they are, or do they need more bling? Give me glitter over bows any day! Hilarious that your dad has had glitter in his garage since the 70s – I wonder what his plans were for it?! Oh, who knows. But it came in handy, as does most of the stuff in the garage, eventually. Hey, if you keep something for 40 years, you might eventually use it!